All doors in the Truedor range will soon be fitted with a TS007 2 Star High Security Door Handle as standard. This new standard Truedor specification will include a handle and cylinder combination which meets the TS007 3 Star Security standard. 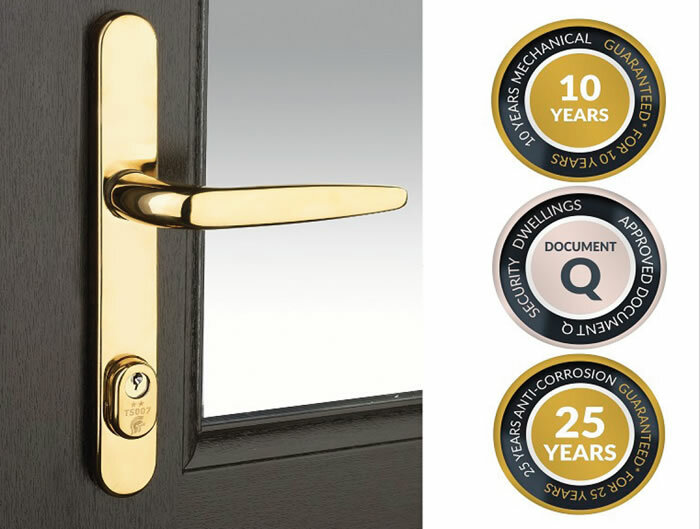 Even more robust than its predecessor, this new handle is designed to protect the cylinder from attack and provides a visible and obvious deterrent to the potential intruders. The new handle maintains the stainless steel finish and corrosion resistant performance. What’s more, if you choose a Kinetica 3 Star security cylinder at the point of order, the hardware on your door will be upgraded to a 5 Star Security performance. With immediate effect Truedor will be supplying black seals on all its doors, including Fire Doors. The new colour will make the seals easier to clean, whilst continuing to provide great compression in support of outstanding door performance. Click Here to download fitting instructions.